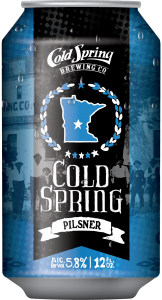 COLD SPRING, MN – Cold Spring Brewing Co. (CSBC) and Third Street Brewhouse are excited to announce the release of Cold Spring Pilsner, the second beer in the company’s Historic Beer Series. This beer is a dry-hopped pilsner brewed with Cascade hops This beer honors Michael Sargl, the brewmaster who founded CSBC, and can be found in stores and on tap beginning October 1, 2017. The first Historic Beer was Brewer’s Tears released in June 2017 and Kegle Brau will be released in February 2018. In 1874, German immigrant Michael Sargl came upon “Pure Spring Waters” and opened Cold Spring Brewery to bring a piece of the old country to his new home. Sargl longed to brew beer like he did back in Germany and made do with brewing outside in a kettle near the spring. Nearly 100 years later, CSBC became famous for an export style pilsner that would have made Sargl proud. This brew was dry-hopped, making it truly unique. In the 1970s, not many brewers were experimenting with the dry-hopping process. The brewers at CSBC were known for this style of brewing, which speaks volumes of their innovation and forward-thinking. Dry-hopping is a brewing technique typically seen in modern IPAs and pale ales. The process involves adding additional hops after fermentation is complete. Because the additional hops are steeped rather than boiled, the dry-hopping process allows beer to take on more intense hop aroma and flavor without increasing bitterness. Cold Spring Pilsner is a rich, golden color of traditional pilsners as well as has bright, hoppy aromas and flavors. Bringing this historical brew to market is a testament to CSBC’s innovation and ability to stand the test of time. 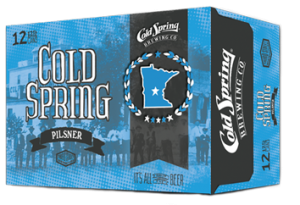 Find Cold Spring Pilsner near you today! Click on the Pilsner box to use the Beer Locator. The first beer in CSBC’s Historic Beer Series was Brewer’s Tears, a pre-prohibition lager brewed from a hand-written recipe, found deep in CSBC’s archives. When prohibition was enacted, CSBC was forced to pause production and dispose of all alcohol. Brewery owners stood by stoically watching this tragedy. Brewmaster Hermanutz walked away with a tear in his eye – hence the name, Brewer’s Tears. The surviving Hermanutz family were excited and proud to honor their grandfather’s history with the recreation of this historical brew, receiving the first cases of this release at the release party in June 2017. CSBC plans to release the third and final beer in the Historic Beer Series with a celebration in early 2018. Look for Cold Spring Pilsner and other Third Street Brewhouse brews at a local retailer near you. Cold Spring Pilsner will be available in 12-pack, 12oz cans beginning October 1, 2017. Cold Spring Pilsner will also be on tap at the Third Street Brewhouse Taproom, which is open on Fridays from 4-8pm and Saturdays from 12-5pm.